Rwanda's community courts, known as gacaca, have finished their work, after 10 years of trying those accused of involvement in the 1994 genocide. The courts were set up to speed up the prosecution of hundreds of thousands of genocide suspects awaiting trial. Human rights group say the gacaca fell well short of international legal standards. About 65% of the close to two million people tried have been found guilty, according to latest government figures. Rwanda's legal system was left in ruins after the massacres by ethnic Hutu militia and soldiers of some 800,000 minority Tutsis and politically moderate Hutus in 100 days between April and June 1994. The UN's International Criminal Tribunal for Rwanda was set up in neighbouring Tanzania to try the ringleaders of the genocide - it has convicted 54 people and acquitted eight so far. It is due to be closed down at the end of the year. But this left hundreds of thousands of people accused of involvement in the killings, leading to an enormous backlog of cases in Rwanda. Community courts were set up to clear the backlog - and once a week the so-called gacaca met in villages across the country, often outdoors in a marketplace or under a tree. The BBC's Prudent Nsengiyumva in the Rwandan capital, Kigali, says one of the main aims of the gacaca was to achieve truth, justice and reconciliation among Rwandans. Gacaca means to sit down and discuss an issue. The hearings gave communities a chance to face the accused and give evidence about what really happened and how it happened. 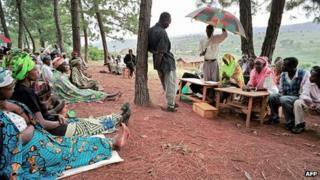 Our correspondent says many people in Rwanda say this process have helped to mend the wounds of the past. But the use of traditional grassroots courts to try complex genocide cases was also controversial - previously the gacaca had only been used to settle local disputes. More than 160,000 judges were elected from among communities - but they lacked legal qualifications. The Rwandan government says about two million people went through the gacaca system - final official figures about how many were found guilty are yet to be released, but data from two years ago points to a conviction rate of about 65%. Some of those found guilty have been sentenced to long jail sentences, with hard labour. Others have been released and sent back to help rebuild communities - and this has brought its own problems, legal experts say. "Survivors are worried about their security because they are living side by side with those who had wanted to previously exterminate them," Albert Gasake, the Legal Advocacy Project Coordinator at the Survivors' Fund Organisation told the BBC's Network Africa programme. "Suspicion is very high," Mr Gasake said. He also says failure to compensate survivors for the loss of their properties poses another threat to genuine reconciliation. Our reporter says most Rwandans do not openly criticise the gacaca system. But local and international human rights groups have expressed concern about its fairness because trials were held without defendants having access to qualified lawyers. The courts' closure leaves many unanswered questions, our correspondent says. Human rights groups are asking why some members of the ruling RPF party never had to face the gacaca courts.